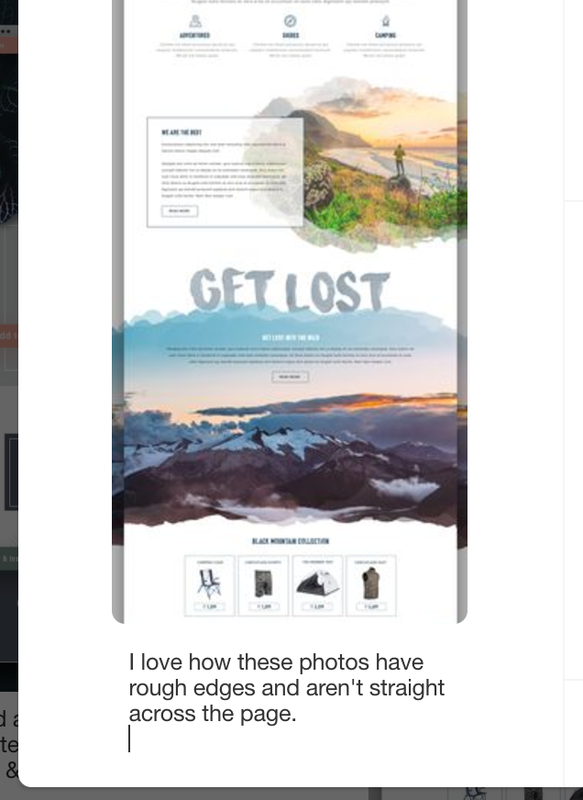 At the start of all branding and Squarespace design projects, I ask my clients to create a Pinterest inspiration board. This is so I can get a sense of their style and ensure their brand reflects their personality. I also ensure their visuals not only align with their brand’s authentic essence, but also get a sense of their preferred design tastes. But, how do you make an inspiration board? This post will walk you through it, step by step! If you don’t already have a Pinterest account, it’s basically like a giant bulletin board for saving ideas and things you find online. It’s your virtual vision board for your designer. You can sign up for a free account here. Once you’re logged in and your account is set up, here’s what you’ll do to create your project’s inspiration board. You’ll want to create this as a secret board, meaning it’s not viewable to the public (unless you don’t care and/or would like the public to be able to see your board, it’s up to you!). Click on the toggle switch next to “Secret” to hide it from the public. Click Create. Your new board will show up underneath your public boards in an area only you can see. 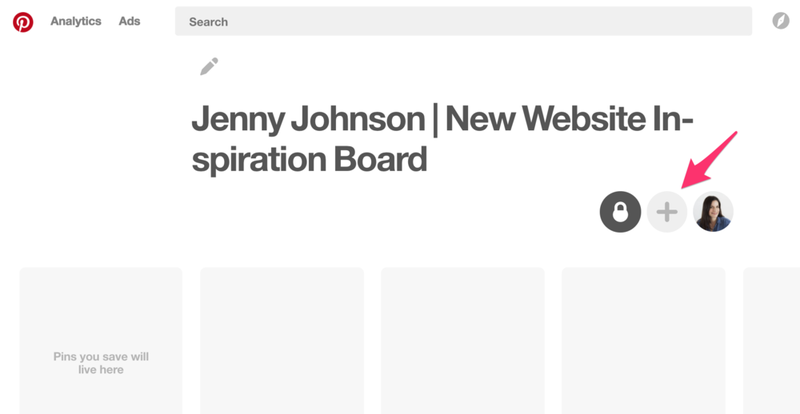 To share your new board with your designer, click on the + icon at the top. Enter your designer’s email address (if that’s Bloom, enter: hello@bloomdesigns.co) and click the grey “Invite” button. 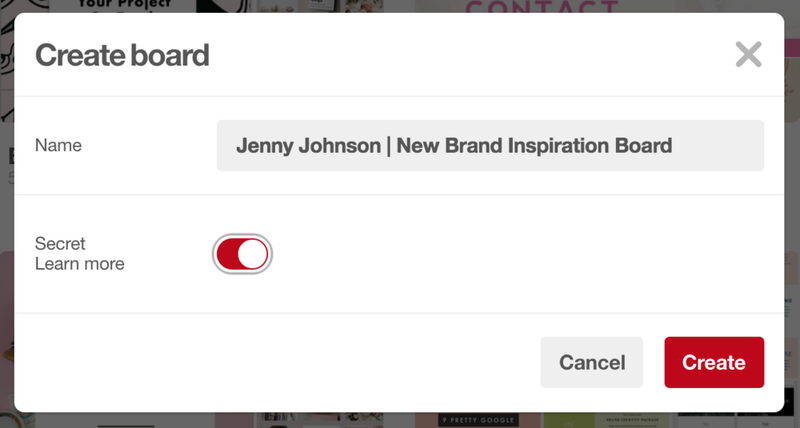 Pinterest will send an email with a link to your designer to view your secret board! What Should You Pin on An Inspiration Board? The short answer is: anything you like! The long answer is: examples of websites and/or logos you like, landscapes, nature or city scenes with your favorite colors, or even home decor pieces that resonate with you. Pay attention to textures and style when selecting pins for your inspiration board. Are your selections bold and colorful, or conservative and subdued? Rustic or modern? You should see a cohesiveness to your board around your 15th pin with similar colors and styles, etc. Here’s an example of my board. Your designer will assess your style and preferences from the inspiration board and use it, along with your completed design brief, to put together a mood board for your brand. Here’s an example of how this process works here at Bloom. The image on the left is the client’s Pinterest inspiration board and on the right is their new brand mood board. Think about the vibe or essence of your brand and visuals, colors and quotes that align with its personality. Also keep your ideal customer in mind - what would he/she wear, what would her/his home look like? What symbols perfectly represent your brand? If we’re working on a new brand identity and logo together, search for “logo designs.” You’ll get a wide range of designs in your search term results. Play around and see if there are any designs you love that might you, or a style or effect you might not have thought of. Anything that strikes you, pin it! And of course anything else you love that perfectly represents your brand’s essence! While pinning items, you may find that you don’t like everything about the pin. Maybe you just like a website’s color palette, or the way the top photo takes up the whole screen. In your pin, write what you like about it in the description. This specific information will help your designer incorporate your favorite design elements into your own project where appropriate. To do that, click the edit icon below the pin before you save it to your board. You’ll be amazed at how much time and energy you save for both you and your designer by creating a Pinterest inspiration board. You’ll think your designer became a psychic when creating your brand, thanks to this board! Now go pin to your heart’s content! Ready to get started on your next branding or Squarespace web design project? Schedule a free consultation with me!